Meghan Markle has officially met the in-laws – all of them – when she attended the Queen’s annual Christmas luncheon. With 30-40 members of the royal family in attendance, it was a wonderful (if overwhelming) opportunity for Meghan to meet everyone. The Queen’s annual Christmas luncheon is hosted at Buckingham Palace and while we can only guess what goes on inside those walls, we imagine its a feast fit for a King (er, Queen). The lunch kicks off the Christmas celebrations for the royal family before they all decamp to Sandringham. 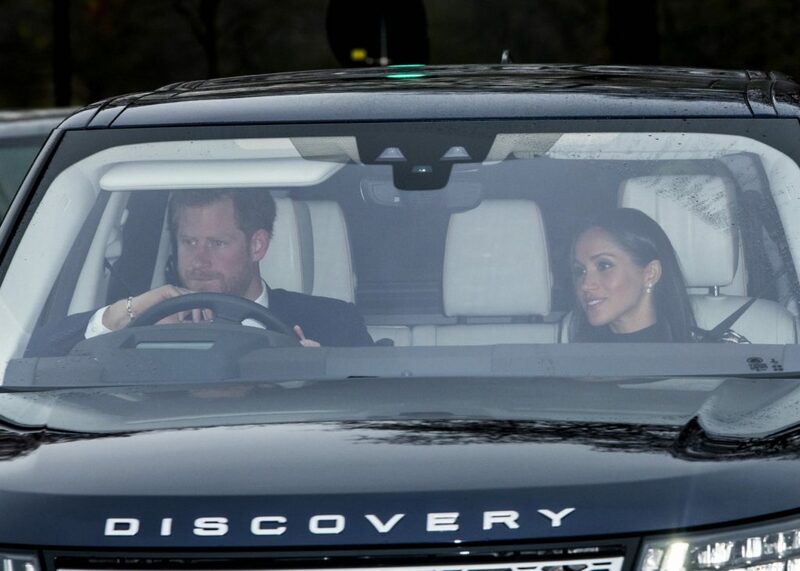 Because it is a family-only event, we got a quick glimpse of Meghan in the car arriving at Buckingham Palace. Dress: Self Portrait “Nightshade” Midi dress Earrings: Maison Birks “Snowflake” jacket earrings What did you think of Meghan’s “Meet the Family” look? « How might Meghan’s Style Change when she is a Royal? Oh gosh I hope Meghan’s all right in there! She looks strangely distant already inside that big 4WD. That’s a stunning choice of dress she’s picked, she’s a savvy fashionista, staying demure while keeping a neat twist with the patterned top. Love the contrast mock turtle neck. It’s a great look! We can only imagine the pressure she must have been under to get the look right. New think she nailed it! She manages to reference A-lister while staying respectable royal – quite a trick! Wow, thanks for putting this post together so quickly MM!! I think this dress is quite stunning and I bet Meghan looks great in it!! But I’m really enthralled with these earrings, my goodness they are gorgeous!!! I really, really like this style of earring (I don’t know what this style is called though), where there’s a stud and then a bit that hangs down from the back of the ear. Imho, it’s a great and fun twist on a classic stud look. 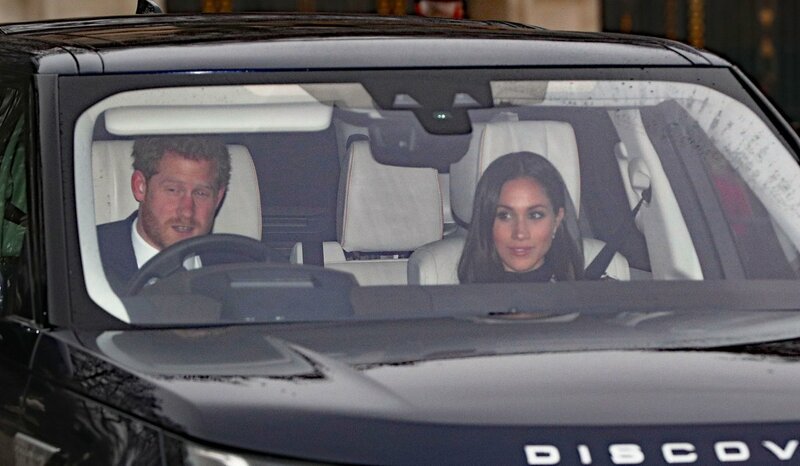 I did notice that this dress has short sleeves and I wonder how Meghan will stay warm in the large, cold and damp BP? I’m always cold so I take a lot of notice when someone wears a shorter sleeve in the winter, I don’t know how they do it! Hmmm, I never spotted that about the earrings, thanks for pointing it out. It’s fun that they’re a snowflake style, and they have enough sparkle to show up at a big palace ‘do’. She may have had a wrap/coat/something else in her lap or in the back seat! I know I hate riding in the car with my coat on. Maybe she gets hot and sweaty when nervous…I know I do! I always have to wear short sleeves/sleeveless tops whenever in high stakes situations so I don’t get super hot and sweaty…go figure. Is it just me or does the photo of her in the car show a wide black collar on the dress whereas the dress on the website does not have a black collar? 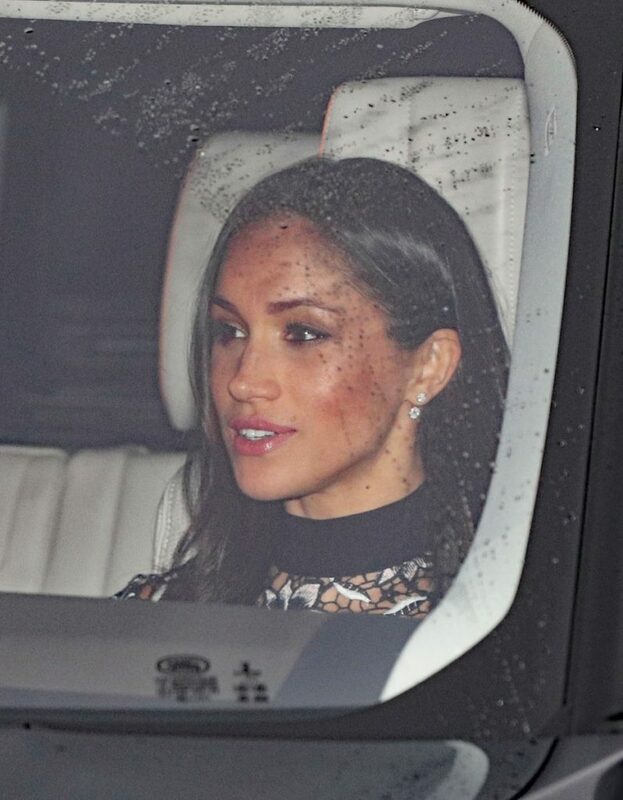 Have you been able to find a more affordable dupe for Meghan’s earrings? I am in love with them but the price point is outside what I would like to spend on this.